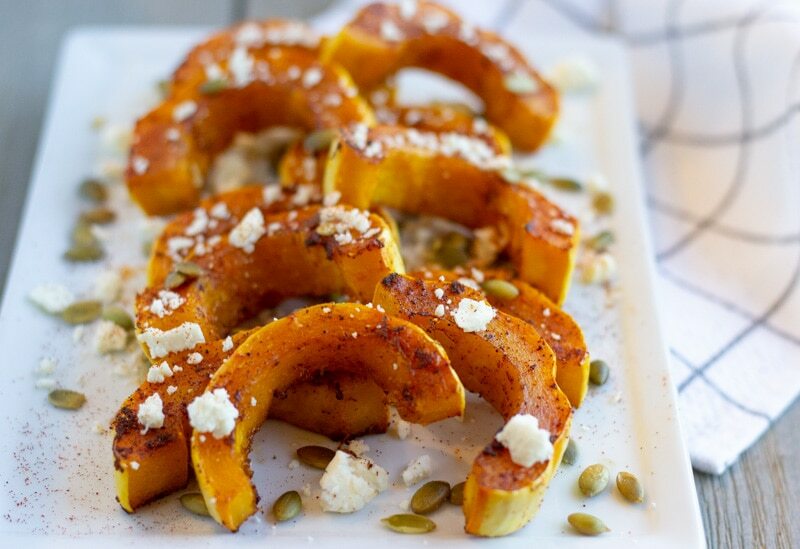 Delicata squash seasoned with chili powder and paprika topped with a salty cheese and roasted Pepitas. This was the first time I had made Delicata squash. I’ve been seeing more recipes using this squash and decided to give it a try. So glad I did, because this squash tastes good and you can eat the skin. So no peeling required! I love that it’s seasonal and just embodies Fall. 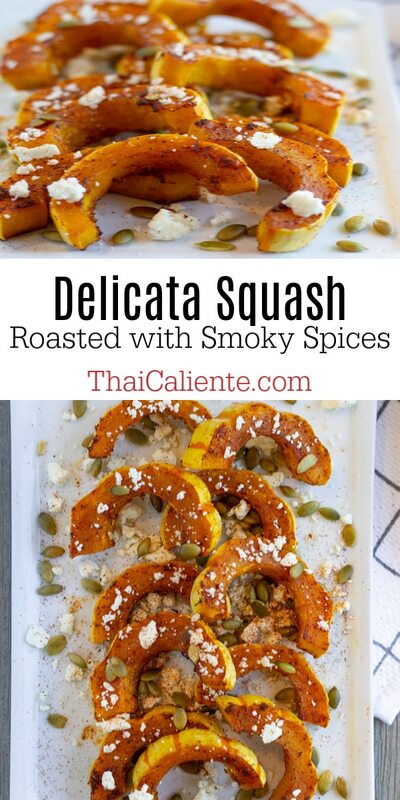 I read that the taste of delicata squash was similar to Butternut squash, but less sweet. For the seasoning, I decided to go with a smoky blend of chili powder and paprika. Similar to the one I used on my sweet potatoes here. The seasoning went perfect with some roasted and salted pepitas and crumbled Feta cheese. You could also use cotija cheese since that would go well with the spices. I love the crunch the pepitas give and all the flavors work well together. This delicata squash would be great for a Holiday side dish or for a weeknight meal, since it only takes 20 minutes to roast in the oven, and no time consuming peeling involved. I served this with some baked fish, but I’m sure It would go great with any protein, especially with turkey. The presentation of the squash looks elegant too. I wanted to add a sweet component like pomegranate seeds or dried cranberries, to give a pop of color too. Unfortunately the pomegranate seeds I bought had already gone bad. I’d love to hear what you’re making for Thanksgiving, leave me a comment below! Be sure to tag me on IG @ThaiCaliente if you make any of my recipes and follow me on Pinterest to save them to your boards. 1 Delicata Squash Rinsed thoroughly, then halved with seeds removed, and cut into 1/2 half moons. Preheat oven to 400 degrees. Wash delicata squash well, since the skin will be part of the dish. Pat it dry, then slice halfway lengthwise and remove all the seeds. Cut into 1/2 inch half moons and place on baking sheet in a pile. 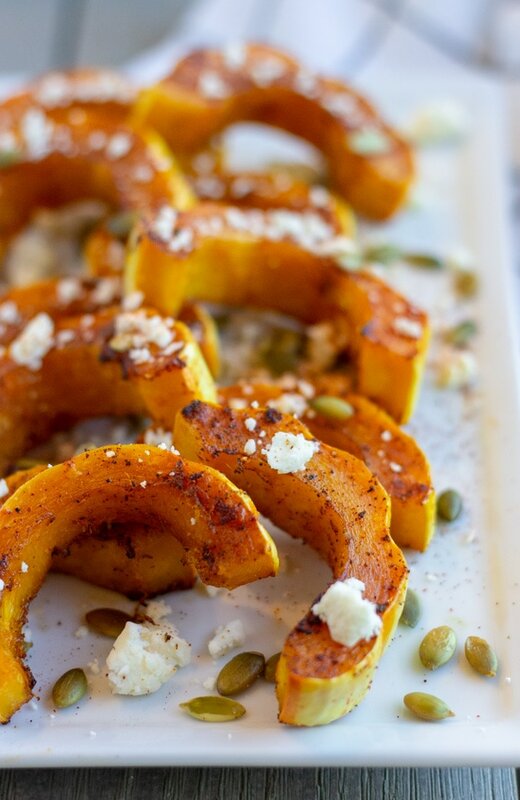 Add Oil and spice blend to squash and mix well with your hands to distribute evenly. Then space them apart on the baking sheet and bake for 20 minutes, turning them over once halfway through. 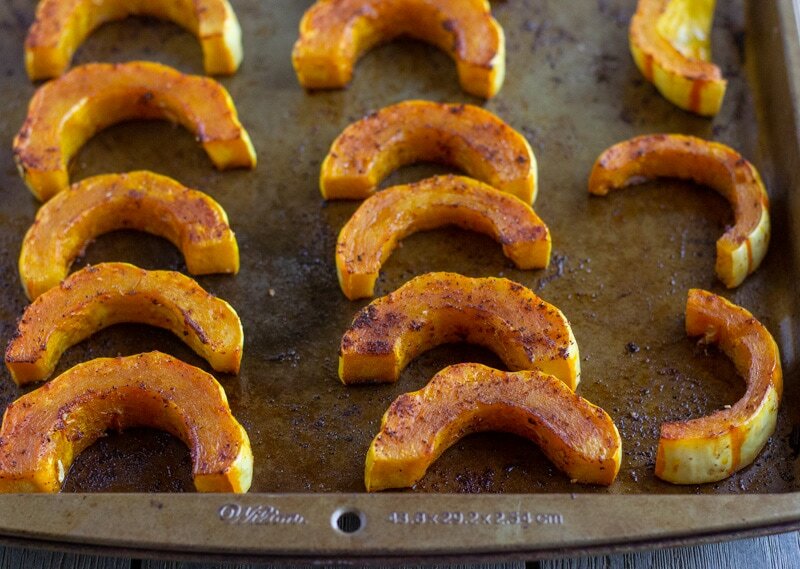 You want the squash to be soft and have some caramelization on them. 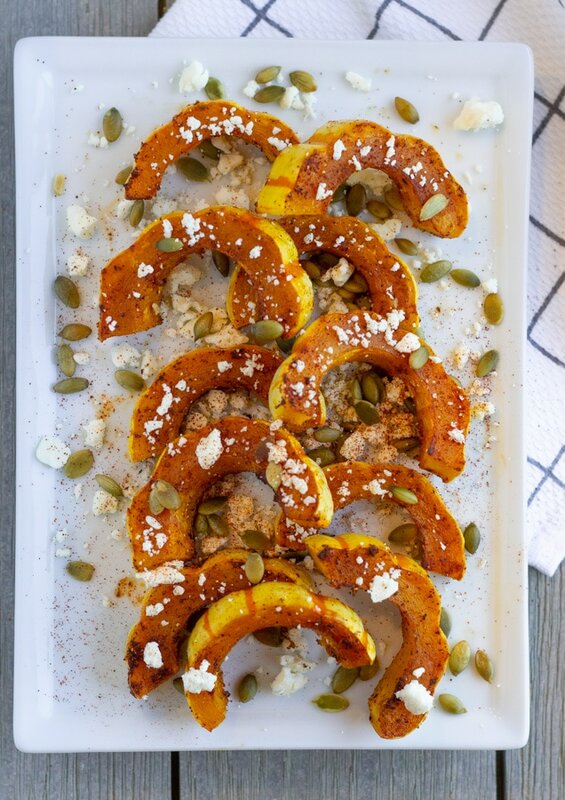 Place delicata squash on a serving plate and garnish with Feta or Cotija cheese, roasted pepitas, and optional Pomegranate seeds or dried cranberries.